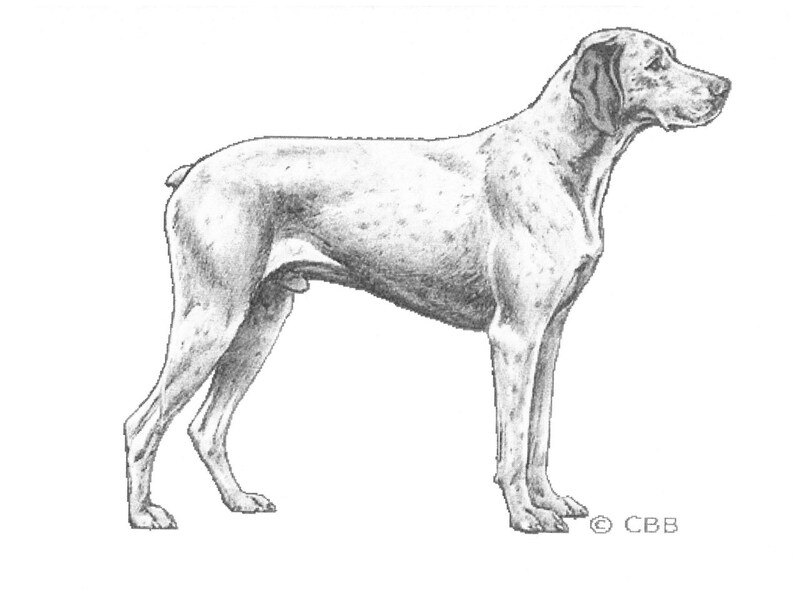 These illustrations do not necessarily show the ideal example of the breed. The sequence might differ slightly from the original breed standard. : France (Province of Bourbonnais). : The Bourbonnais Pointing Dog was already known in 1598 (“Natural History”, Aldovrandi – National Library). The ancient authors described him as a pleasant companion of the hunter, of hardy and healthy appearance. His white coat is entirely covered with fine brown or fawn ticking. The breeders of the 1930’s wanted to impose a “faded lilac” coloured coat along with the obligation of being born with a naturally short tail. This strict selection put the existence of the breed in danger. In the 1970’s, a team of breeders decided to work for the survival of the Bourbonnais Pointing Dog. The present state of the breed allows us to be confident about the future of the breed. : Medium sized, short-haired “Braque” type (“braccoid”), medium proportions tending towards brachymorphic type, of robust build, compact and muscular. He gives the impression of strength and power, without excluding a certain elegance. The silhouette of the female is less stocky and more elegant. The length of the body is equal to, or slightly more than the height at the withers. The depth of the chest is equal to, or slightly more than half the height at the withers. The length of the muzzle is slightly less than that of the skull. : In the home he is kind and affectionate. When hunting, his passion and intelligence allow him to easily adapt to the most varied terrains and game. When searching, he naturally carries the head high to find the scent, proving his aptitude for useful and precise pointing. : The essential breed characteristic is the so-called “pear” shape. Neither too fine nor too heavy, it is well proportioned to the body. : Round, seen from all sides. The lateral sides are rounded, the parietal bones and zygomatic arches well developed. The axes of the skull and the muzzle are parallel, or very slightly divergent towards the front. : Broad, with well opened nostrils. It sometimes protrudes over the perpendicular line of the lips. Its colour matches that of the coat, without unpigmented patches. : Strong and broad at its base, tapering slightly towards the tip to form a truncated cone. Not as broad in females. Bridge of the nose: Straight or slightly convex. : Not too thick, the upper lip covers the lower lip without forming too much of a fold at the corners of the mouth; the edges of the lips are well pigmented. : Strong and of equal length, with complete dentition, forming a scissor bite. A level bite is tolerated. : Large, more or less rounded, hazel or dark amber depending on the colour of the coat. The look is expressive, kind and intelligent. The eyerims are well pigmented. : Of medium length, they can either reach or extend beyond the throat. Their base, rather broad, is attached at eye level or slightly above, which is appreciated. They hang naturally against the cheeks, flat or slightly curled inwards. : Not too long, muscled and with good reach, it fits smoothly to the shoulders. A slight dewlap is tolerated. : Straight and well sustained. The withers are well defined. : Solid and well muscled. : Short, broad and muscled; well coupled to the back. Slightly longer in females. : Rounded, moderately oblique, with powerful muscles. : Chest Wide, long and deep, reaching or extending slightly below the level of the elbow. The sternum reaches as far back as possible. Ribs well sprung. : Progressively rising. The flank is flat and only slightly raised. : Some dogs are born naturally without a tail. If this is not the case, the tail should be docked at its base. It is set rather low. In countries where docking is illegal, the long tail should be carried below the topline when the dog is standing. : Seen as a whole Very muscular. Seen from the front Upright . : Oblique, fitting tightly against the thorax. Solid and apparent musculature. : Rather long and muscled. : Fitting close to the body but not too tightly; neither turned in nor out. : Straight and muscled, with strong bone without appearing coarse. : Sloping very slightly in comparison to the forearm. : In line with the body, round or spoon shaped, pads firm and resistant, toes tight fitting and arched, strong nails. : Identical to front feet. : Seen as a whole Strong bone with a very apparent musculature. Seen from behind upright and parallel. : Long, well muscled, well let down. : Strong, with good angulation between upper and lower thigh. : Muscled, practically as long as the upper thigh. : Well let down, strong and well angulated. : Vertical and strong, without any deviation. : Strides of average reach. When hunting, the gait is a sustained gallop, balanced and supple. : Supple, without being too thin, without folds. : Fine, dense and short; a little coarser, and sometimes longer, on the back. On the head and ears, the hair must be finer and shorter. The white patching is very invasive, with fine brown ticking (formerly called “wine dregs”) or fawn flecking (formerly called “peach blossom”) and all variants. The ear is generally the same colour as the ground colour and more or less ticked. An intimate mix of white and coloured hairs, giving an overall roan colour, is also accepted. On the head, as for the body, coloured patches are only accepted in small numbers and sizes. Faults in general build: Long assembly. Ears too long and too curled inwards. Overall build, too heavy or light boned. Stocky appearance. Head disproportioned in comparison to the body. Muzzle pointed and pinched. Lips too important, forming a square muzzle. Coat with too large patches of colour. Overwhelming patches on the head. Cranio-facial lines converging towards the front. Bridge of the nose distinctively convex. Overshot or undershot, with lack of contact between incisors. Presence of dewclaws or evidence of their removal. Coat entirely white. Any colour not conform to standard.